Hello magazine | Wedding apparel and Party ! The reader Elisa Rodrigues Hoppe is spending some time in London, but that does not mean stop reading the Noiva.com. Earlier today she read about our curiosity and bets about the wedding dress Ayda Field, who this weekend married British singer Robbie Williams. The photos were published in Hello magazine, but here we only managed to spy the cover. Guess what Elisa did? The magazine was a newsstand, bought and pulled his iPhone to make some pictures for us. Courtesy of Elisa, then we will see more photos of this gorgeous dress too. Ah! And I hit, you know? 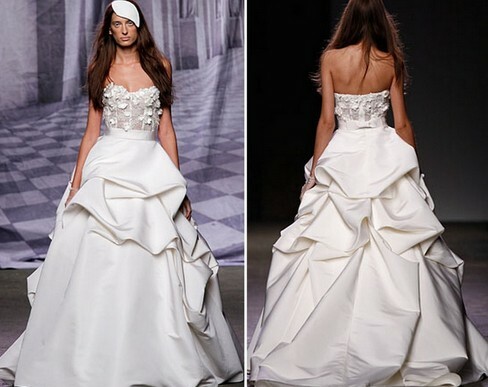 It’s the same Monique Lhuillier that bet early (below the catwalk). Gorgeous! Elisa, super mega thanks for caring with us. We were biting us with curiosity to see this dress in all its details. Loved the look from head to toe! And you, brides?